This new unique timepiece by Hamilton has discovered its own way of putting the past, present and future on the same map. Its design structure is inspired by the geographic coordinates system based on lines of latitude and longitude. 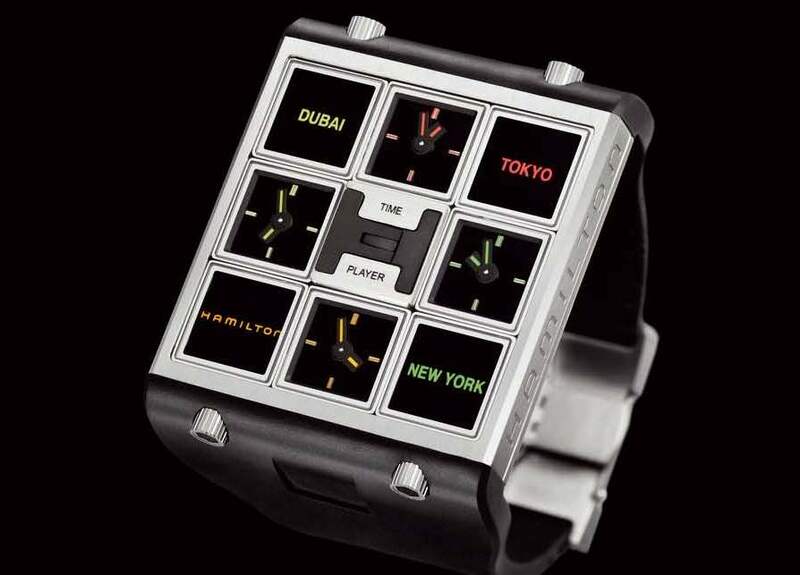 Implementation of its unusual timekeeping concept unites finger-operated timekeeping in four up-to the-minute time zones with zany design belonging to the future. In this watch Hamilton provocatively merges nostalgia for its American roots with the latest Swiss technology to offer a glimpse of tomorrow. This timepiece lets the fingers do the walking, leaving the mind free to exercise its memory and imagination. Hamilton took inspiration for the Time Player from a design the company originally created for a clock in the Stanley Kubrick movie, 2001 : Space Odyssey and brought it back to earth. For centuries, man believed that the earth’s surface was flat. Hamilton playfully revisits this idea with the Time Player watch, in a design that is resolutely contemporary and inspired by a society constantly on the move, taking change in its stride. A totally flat 48 mm by 42 mm titanium case is split into nine squares, eight filled with movable counters and one left empty like a sliding puzzle. These counters, separated by lines symbolizing those of latitude and longitude, enable the wearer to set and measure time in the current location, plus three others. A Hamilton logo marks the here and now, while the additional three places are identified by color-coded printed names of the dynamic metropoles, Dubai, New York and Tokyo to prove that the brand is always on the move. The remaining four counters are all individual watch dials, in colors to match the corresponding location, so that they can dedicate their energy to tracking the passage of time in the defined destination. To set the time in a desired time zone the wearer simply moves the corresponding miniature watch to the central square and adjusts via a crown. Once this is done, all of the counters can be moved around again at will. Two easy to grip crowns are positioned on each of the two sides of the case where the attachment joins. The thick black rubber strap also picks up the theme of right angles with corresponding indents and a neat folding buckle. The Hamilton Time Player represents the spirit of the brand that has always been tuned into the future to develop innovative models and new technologies.The Time Player is a creation of the Hamilton Lab. In this dedicated laboratory, product, technical, logistics and marketing specialists collaborate to develop innovative timepieces inspired by the rich history of the brand and its pioneer‘s spirit.